Dylan's music has inspired anti-war and freedom loving people all over the world ever since the days of Greenwich Village, New York. It is in this light that Dylan and his music are relevant to Bangladesh, not to mention the young students in the country as well. He's been 'analysed, categorised, finalised & advertised; dissected & rejected' and 'all he really wanted to do was to be friends with me & you'. Bob Dylan, one of the most influential & enigmatic personalities of western popular music, celebrated his 70th birthday on 24th May 2011. For fifty years since 1961, Dylan has been enchanting and mesmerising 'chimes of freedom' that keep on 'blowing in the wind' transgressing all boundaries making him a true artist of the world. His music has inspired anti-war and freedom loving people all over the world ever since the days of Greenwich Village, New York. It is in this light that Dylan and his music are relevant to Bangladesh, not to mention the young students in the country as well. The human price of independence for Bangladesh in 1971 was three million lives in just 266 days at 7.83 lives per minute. Fortunately, Bangladesh was not alone. The Bangladesh War of Independence was fought by Bangladeshis inside Bangladesh and by Friends outside Bangladesh. Western popular music came of age through The Concert for Bangladesh when music was used as a weapon to fight a war. At the request of Ravi Shankar, George Harrison organised The Concert for Bangladesh at Madison Square Garden, New York on Sunday 1st August 1971. With the support of the freedom loving people of America, The Concert for Bangladesh was instrumental in creating awareness in an age where there were no Twitter and Facebook as has been the case in the recent Arab Spring across the Middle East. Organising a benefit concert is always easier said than done. This was the first time George Harrison was doing something on his own after the break-up of the Beatles as he confessed to his 'friend' Bob Dylan the night before the concert. It was equally challenging for Dylan. Since his motorcycle accident in 1966, Dylan had made only one public appearance at the Isle of Wight in the UK in 1969. The Concert for Bangladesh would be his second live appearance since then, but to a wider audience towards a much larger cause -- The War of Independence of Bangladesh. Dylan was so nervous that everybody was doubtful he would perform. After performing 'Here Comes The Sun', Harrison introduced “I'd like to bring you all a friend of us all, Mr Bob Dylan.” That was it. The stage was set. And there was no point of return. 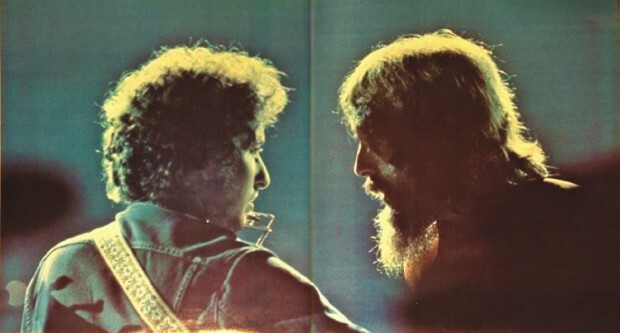 With Harrison on his right and Leon Russell on his left, Dylan sang 'A Hard Rain's A Gonna Fall'; 'It Takes A Lot To Laugh, It Takes A Train To Cry'; 'Blowing In The Wind'; 'Mr Tambourine Man'; and 'Just Like A Woman'. Dylan's performance at The Concert for Bangladesh ranks as one his best live performances ever because Dylan sang like a man submitting to fate who was waiting for an outlet for his Soul to cry just like the people of Bangladesh had been waiting for 214 years since 1757 and 24 years since 1947 to the let world know of their own Soul in 1971. Bangladesh was very lucky to have had Friends during her War of Independence. Bob Dylan was one such Friend when friends were rare like a 'ruby in the sand.' On behalf of the 'Campus Generation' of Bangladesh: Happy 70th Birthday 'Mr Tambourine Man.' May your music carry on taking people 'upon your magic swirling ship through the smoke rings of our mind' with good health and happiness today, tomorrow and forever.